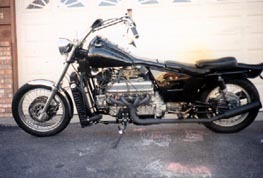 The idea came to me to put the aluminum Buick 215 CID V8 engine in a motorcycle because its so incredibly light weight, and a work associate of mine had one lying around. They were originally made in 1961-63 and only available in the Buick Special (Olds had a version of their own). I put forth the idea of joining it to a Moto Guzzi transmission and drive train to Marty Mataya of Trackstar Enterprises in Minneapolis. He happened to have an Ambassador frame with an Eldorado five-speed and rear wheel (no engine or front end) that he'd be willing to sell me reasonably. 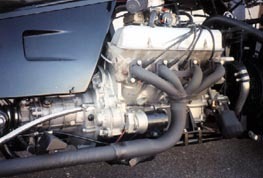 From there some measurements showed that the height and width comparing a Guzzi twin to the Buick 215 CID V8 at the valve covert and sump were dimensionally close. So I decided then and there to go for it, and bought the V8 engine and Guzzi parts. After a Guzzi made a legendary 500cc V8 works racer in the mid/late 50s, I thought I' d bring back that legend with a V8 Guzzi that's more than seven times (3613cc) the size. The next ten years I spent designing, machining, adapting, fabricating, building, and assembling to completion. The engine alone turned into a major project to rebuild, with hard to find parts and more modern and expensive Rover parts (the British Rover engine is still the same aluminum engine GM once made). Other major parts include a Honda V65 Magna anti dive front end with brake calipers; a 650 Yamaha front wheel and brake rotors with a 36 spoke imitation of a Borrani rim. Harley Davidson provided fat bob gas tanks, and a soft tail rear fender. Guzzi parts included the aforementioned parts and Eldorado sump type differential housing with Convert ring and pinion (spline differences adapted), with an 850-T cush drive hub and double leading shoe brake, and a California LAPD side stand. Numerous automotive parts were also used or adapted as well. 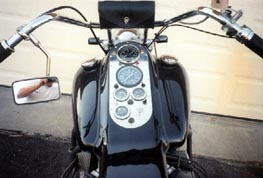 It has Stewart Warner marine gauges that complement a Convert speedometer. The engine, while broken in on a dynamometer, measured 180 HP and 205 pounds of torque at the flywheel. The bike weighed in at 795 pounds with fluids, and had an 80" wheelbase. 'The thrill of riding it was well worth the effort. The throttle response is massively torquey. The torque reaction while blipping the throttle in neutral is about three times that of a healthy LeMans. It is very smooth and vibration free. Then there's that ferocious V8 snarl coming out of the Suppertrap mufflers. It handles exceptionally well for such a long wheelbase. It has a low center of gravity and really holds a stable straight line, and has a lean angle limit of about 30 degrees, (try that with a "Boss Hoss". It also gathers a lot of attention both while riding it, and when it's parked. Fuel economy and range is poor as you might expect. However there are still some bugs to work out of it. Even with the Convert rear gears (the tallest ones available) it's turning more RPM than necessary - 2700 at 60 MPH. The major problem however is the Guzzi OEM clutch with Barnett springs won't hold when pushed much. It naturally slips easier in the taller gears. Any more than about 1/4 throttle in fifth gear you can really feel the clutch slip. I can't even come close to using all the available power. I really thought the Guzzi clutch would hold for a while, and just have a shorter life. After all I've read in a past newsletter of a 180 HP nitrous injected LeMans. How did his clutch hold? It won't even hold enough to spin the wheel, not that I care to do any burn outs, I'd just rather see traction loss than clutch slippage. I've also thought of other ways to gear it taller to improve mileage and take more advantage of all the torque. 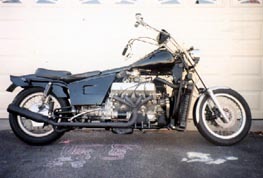 One way would be to convert it to chain or belt drive; (see Swiss modified Guzzi Swallower from December '94 newsletter). Another thought is to have taller fifth gear pairs machined for a high-speed cruising gear. Type - Four stroke, 90 degrees aluminum alloy, liquid cooled V-8. Valve train - Overhead valve, two valves per cylinder. Bore and stroke - 3.54 by 2.80 in. Displacement - 3613cc (220 cu in.). Ignition timing at idle -10 degrees BTDC at idle, 32 full advance. Carburation - Holley (4160) 390CFM four barrel, vacuum secondaries. Idle speed - 1000 RPM. Exhaust system - Eight-into-two, adjust back pressure mufflers. Ignition - Breakerless HEI distributor. Air filter - Three-snorkel end washable cotton gauze mesh. Oil filter - Spin on disposable canister. Oil capacity - 5.5 quart wet sump. Engine speed at 60 MPH, top gear - 2650 RPM. Horsepower - 180 at 5300 RPM. Torque - 205 foot pounds at 4000 RPM. 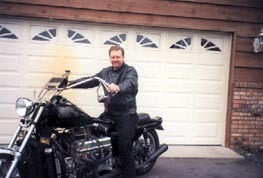 Type - Five-speed, Eldorado Moto Guzzi, constant mesh. Clutch - dry, double plate. Primary drive ratio - 1.235-1. Gear ratios - 1st: 2.000-1, 2nd: 1.299-1, 3rd: 1.047-1, 4th: .869-1, 5th: .750-1. Type - Steel tube, double cradle frame. Rake and trail - 31 degrees, 4.52". Suspension, front - Telescopic 41mm fork tubes, hydraulic dampened, with 5.9" travel. Suspension, rear - Twin coil over, oil dampened, five way adjustment. Preload, shocks, 3.8" travel. Steering caster - 85 degrees, included angle. Brake, front - 270mm duel-discs with twin piston calipers. Brake, rear - 8.6" ventilated drum, double leading shoes. Wheel, front - 36 spoke 2.15 by 19" Borrani rim. Wheel, rear - 40 spoke 2.15 by 18" Borrani rim. Tires - 110/90-19 front, 130/90-18 rear. Fuel tank capacity - U.S. 4.9 gallons. Wet weight (2 gallon fuel) - 795 pounds. Battery - 12 volt, 24 amps, 300 cold cranking amps. Charging system - Alternator with enclosed regulator. 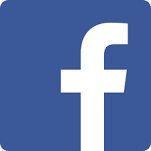 Gauges - Speedometer, tachometer, volts, oil pressure, coolant temperature. Indicator lights - High beam, right and left turn signal, neutral and oil pressure.